A couple of weeks ago, a sharp-eyed UK fan noticed that at the conclusion of the UK broadcast of the second season episode HERE SHE COMES...MISS AMPHIPOLIS the usual disclaimer was replaced with "In loving memory of Keith K. Walsh." The fan was curious as to the significance of the name. The official response from the Xena: Warrior Princess office was that Keith Walsh was Chris Manheim's brother who passed away in 1992 due to complications from AIDS. He was the inspiration for the Miss Artiphys character in the show. We on the editorial staff would like to pass on sincere condolences to Ms. Manheim and her family for this loss, and appreciation that Mr. Walsh's memory lives on in an immortal character. I have not had an opportunity to seriously ponder the 4th season of XWP but from a very casual and shallow perspective I feel it is already better, at least in terms of moderation, than the 3rd season. After saying that, though, I confess, I was not taken with ADVENTURES IN THE SIN TRADE . Many viewers found a strong and compelling attraction to SIN TRADE because of its visualness. I felt, on the other hand, it was too visual. My parochial tastes dictate that if I want to watch a music video, I watch a music video, not XWP. I felt they could have spent more time on telling us why all these colorful characters clicked, not just that they were colorful. Surprisingly, to me at least, I enjoyed A FAMILY AFFAIR much more than I was anticipating. True, this enjoyment arose mostly because of its campy and satirical skewering of a few classic horror/monster movie conventions (which is exactly how Renaissance Pictures established its reputation), but there were other aspects which allowed it to arise above its roots. I was especially relieved to find that Renee O'Connor was at last comfortable enough with the role of Hope to not over act. I took it as a good sign that the writers were exploring the family background and foreground of Gabrielle. I hope they visit back again sometime soon, and it was nice having the folks angry at Xena for leading their little girl astray. Moreover, it got better. A GOOD DAY hearkened back to the golden age of Xena in that it was an old-fashioned story, which did not elevate any of Xena's struggles to "the big picture". It was a revisit to the pre-Rift episodes, but clearly, it was different from anything that could have been shown in the 1st or 2nd seasons. The evolution of Gabrielle was most evident. True, the story and direction had flaws but compared to the flaws found in the 3rd season, I found them easy to overlook. I was disappointed with MUSES . MTV has made it possible to make a killer video with principals who do not have professional dance capacities. We have the technology. They could have made MUSES into a wonderful and visually exciting dance episode (what BITTER SUITE was to musical drama, MUSES could have been to dance), however, they made it rather flat and confused. LOCKED UP AND TIED DOWN was, again gratefully, not about "the big picture" but a nice little episode where Xena gets tortured and is forced to walk around in sackcloth. For some reason this episode reminded me of a Charlie's Angels episode gone awry. Although the episode endeavored to be serious fare, the rat scenes must be seen to be believed. When I first saw the episode, I found the rat scenes bothersome. Now, after reflecting on it after a week or so, I realize the rat scenes elevated the show. What other shows would do this to their leading lady? Xena truly has many skills and propelling with complete accuracy a dead rat straight up 50 feet or higher with her mouth while locked up and tied down, was nothing less that a seasonal highlight. Then, the first seasonal block ended with CRUSADER . This was an ode to perhaps the things to come. The ladies still, even after THE BITTER SUITE , are not talking to each other. They seem to talk the ears of off anyone else they randomly come across (and wait a minute...what were they doing in Phoenicia??? ), but actually have them tell the other what they are thinking...God forbid! This time Xena decides to avert that nasty premonition of their (Gabrielle and Xena) death by crucifixion, by transferring her ownership of Gabrielle to Najara (believe me, you got to see it to believe it, it is frighteningly close to a legal transfer...watch closely). Najara thinks it is peachy keen so she agrees to build Gabrielle a hospice as an incentive. But luckily, Xena comes to her senses and clues in Gabrielle, so she can come to her senses, and then they permanently dump Najara. Whew! Close call. But life is full of narrow escapes in the Xenaverse. Now we have six weeks of repeats to contemplate the first part of the season. After that we will have eight new episodes, then followed by six more weeks of repeats, and then the homestretch of the final six new episodes of the season. Somewhere in those 14 episodes, we will have a side trip to India, a resolution of Xena's death premonitions, and visiting old/new friends and old/new enemies. What I probably will be contemplating the most during this break is the wisdom of the twin development of the jovial Xena of the comedies and the beleaguered Xena who is speeding straight into nervous breakdown land in the dramas. Let us hope there is a higher purpose to all these mixed signals we have been getting. From the Webmaster: Breaking Records At Whoosh! October 1998 was a tremendously busy month for Whoosh! as the statistics went through the roof. Whether it was due to the 4th season going into full gear, a kick*ss fan fiction issue, or some unknown force telling Xenites everywhere to check us out, we broke all previous records for site traffic. When we first started Whoosh! , we hardly expected it to grow to the mammoth cyber-thing that it is today (who knew!). Each month we are newly and pleasantly surprised by the growth of this thing we have given birth to. As proud parents, we would like to share some of the statistics from our most stellar month ever. Here is how the other sections shaped up: The main page of News, Gossip, Rumors had 7,339 inquisitive Xenites looking for all the latest dish and dirt. 5,376 of you searched for the answers to life's greatest Xenite questions in the FAQ. 4,452 of you took our advice and checked out The Palace information page. In the monthly articles, Lunacy took top place with her article entitled "The History of Xena Fan Fiction on the Internet", which got 2,411 visits. And yes, folks, the infamous Taborn Hair article from Issue 1 continued to get traffic -- 149 in October to be exact. So what does all of this mean? This is more than just us bragging about our traffic -- this is concrete evidence of the unique growth and evolution of online Xena fandom, of which we are just a small part. (Compared to Tom's Page, which has grown to 8,000 visits a day, our statistics are small beans.) The growth of the online fandom has most likely been caused by an influx of new viewers from the 3rd and 4th seasons and the USA syndication. The growth of the Internet has probably contributed as well. Whatever the various factors may be, we continue to watch it all with amazement. 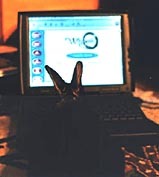 The secret behind the high stats: Pet rabbits read Whoosh! There are at least three things in life that really bug me. One. People in the express line at the grocer who have far more items than the posted maximum (hey, I just want to buy dinner, which consists of a 2-litre bottle of Diet Coke and a packet of crisps). Three. That widespread practise amongst most television stations and affiliates of squishing the closing credits of a TV show into a tiny box and then talking over the closing music. Yeah, I know, none of the above are anything like the problems some people have, but still, it is irksome. Hey, it is my planet too and I have to live here. Slight tangent. I was at the cinema the other day. I took a long lunch and went to a matinee. This was the first film I'd gone out to see in about year. And I prefer matinees, not because they're a couple of dinars cheaper, but because there are usually only three or four other people in the house and I don't have to put up with a ton of whispering, coughing, loud exclamations of why the scene we just saw was stupid, symphonic "bleeps" from a cacophony of electronic clocks on the hour, pagers, cell phones, or drunken declarations of passion for someone named "Janine". In short, it's the next best thing to watching a big screen TV at home, with cool sound and a nearby concession stand that lets you fill out a loan application to buy something right on the premises! So there I am, enjoying my film. It was a good film, I enjoyed it and I'm glad I went. Then at the end of the film, the credits rolled. About halfway through the credits I suddenly realised something. The credits weren't squished into a tiny box. Some annoying announcer wasn't telling me what was coming up next. I could actually read the fine print! I could actually enjoy the music! Yes, brothers and sisters, I confess, I'm one of those people who stick it out after a film and sit through the credits. First. It allows a little "come down" period from seeing the film. I take my entertainment seriously, and I really get into it. If I haven't gotten up and walked out (and I have done that before) after the first half of the film, I'll be there until the end. I need a little time for my emotions to catch up with my intellect. The mood is still there, because much of the time the music associated with the ending credits keeps to the theme of the film. There is an art to it, believe it or not, and I'm one of those few people who really dig it. Second. I actually read them. I like to see who is involved in the making of a piece of art. It's a huge undertaking. Even a "low budget" film has dozens of people necessary to create it. While I couldn't pass a pop quiz on all the names, after awhile I do see some familiar patterns, and I will say things like "Jim did a great job with the sound on this one" or "Man, Bob can really light a set!" This leads to the irritation with TV credits. I see Xena and Herc on a local WB affiliate. The show can also be seen at other times on an ABC affiliate. I'm lucky in that lately, the Xena credits have been run in their entirety, no squishing. Sometimes they're spoken over, but not usually. Herc , on the other hand, gets both the squish and chat treatment, and sometimes the credits get cut off entirely. This is exactly the reverse of what happened last year, when Herc was first in the dual hour time slot and, creditorially speaking, unmolested. Still and all, it would be nice if all stations could just leave this area alone instead of pouncing on it for another opportunity to sell something. People tell me overwhelmingly that on the stations they see HERC and Xena the credits get squished and talked over if they get shown at all. In at least one case, I've seen a station roll credits for the wrong episode (and I've got the tape to prove it). It is possible for television to behave when it comes to credits. Public Television leads the way in this regard. I see Masterpiece Theatre and Mystery unmolested when the credits roll for those features. Can we do something about it? Dunno. We can drop a line to our local stations and complain, which, while it may not always be effective, means at least we don't go down without a fight. Somehow, I think Xena would like that.